Tom Huber is a cordwood master builder who builds with nature on his mind. An eclectic by nature, Tom espouses the philosophy of Christopher Alexander and his idea of using “Pattern Language” to create a homestead that is both meaningful and beautiful. Let me walk you through some of friend Tom’s creations. The first “add on” shows a curved cedar post on the corner. It is certainly eye-catching. Note the rock foundation, the posts were not squared but left natural. This was the first portion of the Cedar Eden homestead. 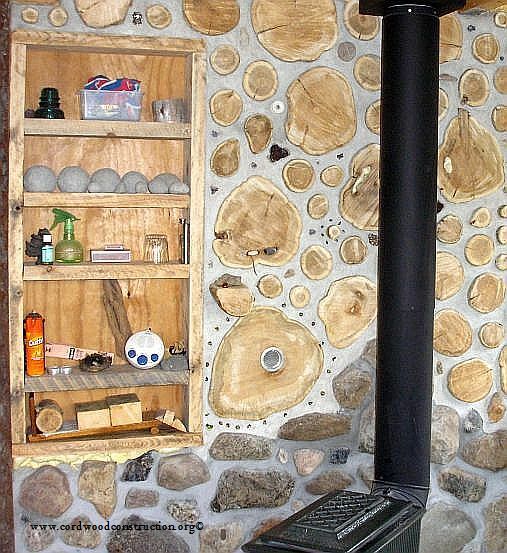 The interior of Cedar Eden with rock wall near the wood stove. There is all manner of rocks, stones, gems and mementoes in the wall. 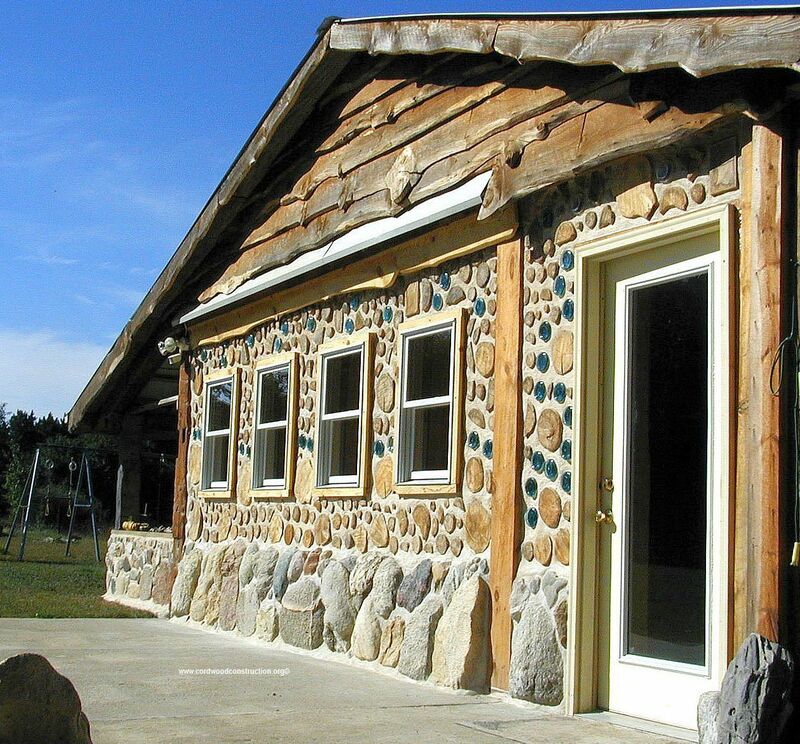 Tom’s original cordwood home was in Michigan. This beauty sold back in 2005 when Tom took a teaching position at Paul Smith’s College in the Adirondacks. It sold for the asking price and the buyer commented that the well-done cordwood was the deciding factor in the purchase. The beautiful stonework, well-laid cordwood, bottle ends and wavy pine siding speaks about a builder who cares deeply about his creation. Tom has the “artistic chops” to back up his work. The carefully laid out stone wall has insulation between it and the interior wall. 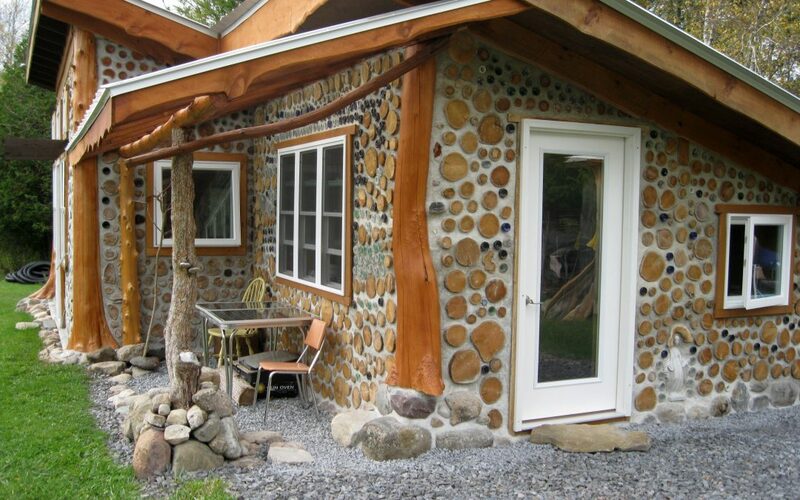 The interior wall is made with 4″ cordwood stubbies which allow the cordwood wall to extend down to the interior floor, while the stone protects and beautifies the exterior. Tom’s first attempt at cordwood resulted in this very attractive cordwood shed. 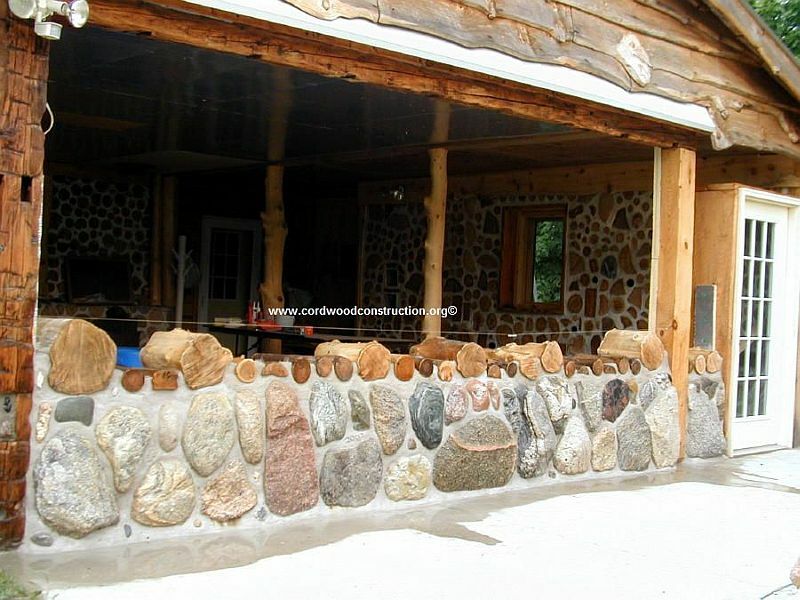 The stone protects the sides and the cordwood gives a feeling of additional sturdiness and warmth. Should you get bitten, not by mosquitoes, but by the cordwood bug, you may wish to take a look at www.cordwoodconstruction.org Read the articles in the BLOG menu, check out the Cordwood eNewsletter on the top menu, look at the workshop schedule and if you want to learn more check out all the ebooks and hard copy books at the Online Cordwood Bookstore. The latest and in my opinion, the best book on cordwood is Cordwood Construction Best Practices, which was just updated.